Today we have released the second Community Technology Preview (CTP) for DotNetNuke 6.2. It has been just about four weeks since the first CTP and a lot of work has been done. We are still a couple months a way from a final release, but we want to take advantage of every CTP or Beta release we possibly can. We really need you to download and install the CTP. Not only to preview the new features, but we need your feedback. We want to know what you like and don’t like. Your feedback is important! In the first CTP release we wanted you to see the new journal and related features. For CTP 2 we have a few more modules we need you to review. As a reminder, a CTP isn’t for production use and isn’t even what we consider beta quality. You should expect to run into bugs and other issues. We will try to guide you as much as possible with blogs, wiki and forum posts. Also don’t forget to ask questions in the Community Exchange. We have a handful of new features that we want to highlight for CTP 2. These modules are still a work in progress, but we feel they are far enough long that you should be able to test out the features and give us some feedback. None of these features are bug free, so don’t be surprised if you run into a few issues. You will see a link to the known issues report Included with each feature description below. A member directory is vital to the success of any collaborative site or site that is based upon user-to-user interaction. Not only do users need to be able to find other users within a site, but they also need to filter the list based upon various types of criteria. The new Member Directory module is awesome! It provides you with easy to access templates and filter options, plus it performs extremely well. The member directory also exposes options for creating friends, adding followers and sending private messages. If you have a testing or development site with a large number of users, we would love to get your feedback on using the Member Directory module. Messaging, similar to email, provides a mechanism for users to communicate within a site in a private manner. In most cases, messaging will be between two users, but it can also include multiple users as well. If you have used the Messaging module in DotNetNuke before, you will find this module extremely different, but in a very positive way. 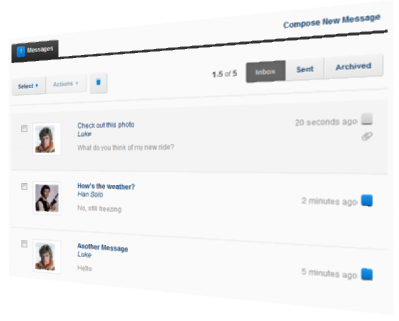 The new messaging module allows you to send to Social Groups (Roles) and also include attachments. You can also address messages to users with a Facebook style autocomplete. Download the CTP and take a look at the new Messaging module. The Social Groups module is still in the early stages of development, but by using the CTP you will be able to see the direction we are heading. We have also made some changes to Roles to better support our needs for Social Groups. 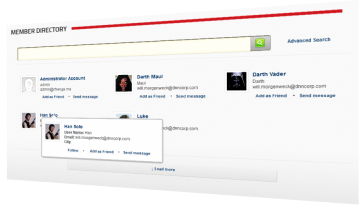 Social Groups are actually quite similar in functionality to Member Directory and User Profile. 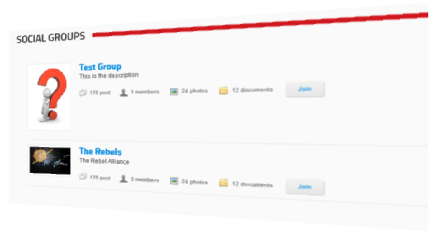 You will be able to see a list of groups, create groups and have a group specific journal. Look for a blog post in the next few days that outlines more details about how to use Social Groups in the CTP. Keep an eye on our Technology Preview page. Within the next few days you will be able give us your feedback and enter to have a chance to win a $100 Amazon Gift Card! We will be looking for some very specific feedback. You will need to download the CTP in order to answer the questions. Make sure you test out the modules listed above. Learn more about the DotNetNuke 6.2 CTP1 Easter Egg Hunt. Download DotNetNuke 6.2 CTP2 and start using the product. We are looking forward to your feedback!